The Maynard is a gem of a wedding venue – nestled in Grindleford village on the outskirts of Sheffield surrounded by the beautiful Peak District. Having Surprise View and Longshaw Estate nearby there are some amazing places for dramatic photographs. The grounds of the hotel are lovely too and ideal for your family to feel at home. We have photographed some lovely weddings here – the staff are awesome and very friendly. 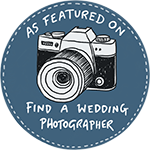 Helen & Paul are a husband and wife photography team specialising in natural reportage wedding photography in Sheffield and the Lake District. We also photograph weddings in the Peak District and all over Yorkshire!